It's not so often that you hear of a ska band coming out of the suburbs of Northern New Jersey, but Day Nineteen is just that- a suburban ska band In it's short history, Day Nineteen has become a favorite of many people in New Jersey & New York, selling out ‘all ages’ shows and delivering their own brand of ska to all. The band had it's infancy in the minds of Jason Foley (singer/guitarist) and Dennis "Woody" Alfonso (drums) in October 1996. They had worked together at a local music store, where Jason taught guitar and Woody worked the counter. Both had always wanted to put a band together and both had a true love for ska. It was put on the back burner for months while each guy worked with other projects. But in May 1997, sparked by the lack of originality on the radio, Jason went out and finally completed the lineup that would soon be Day Nineteen. He recruited many of his high school buddies on horns and his long time friend Nestor on bass. The lineup, although seemingly flawless, did not last for too long with two of the four horn players leaving and Nestor leaving for college reasons by the end of the summer. Many had pegged our heroes as dead and thought that it would be the last anyone heard of the band. Woody and Jason were still determined to make this work, so with the remaining horn section of Obi Fernandez (trombone) and Ryan Dominguez (bari sax), they rebuilt the band from the ground up. Jason looked no further than his own brother Brian Foley (bass) to fill the spot on bass. Obi and Ryan had heard through various musicians of two horn players that were looking to join a band. The rest of the band was so impressed with Aziz Nekoukar (trumpet) and Dave Zaretsky (alto sax) at their first rehearsal, that they were added to the band immediately. Quickly it seemed as though the band had been pieced back together. 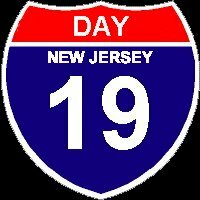 Day Nineteen continues to deliver their unique blend of ska to the masses. Their music can best be described as a form of ska that incorporates all three waves of this Jamaican born music with pop-punk, latin, & swing influences. With a full length CD entitled 13 Legs released on their own independent label, Southside Pride Records, in December 1998, a recent spot on the 1998 Vans Warped Tour in New York City, & an upcoming slot on the local stage of the Vans Warped Tour 1999 in Asbury Park, NJ, July 18, 1999, Day Nineteen hopes to prove to all that they are a strong force in the independent music scene.